When you think of Aston Martin, what immediately comes to mind? Is it British design and engineering, superior craftsmanship and materials? Or maybe it’s sports-car racing heritage and grand touring at their finest? Thanks to a long history, we know now that all Astons possess these attributes to a certain degree.But what about the new flagship road car, the DBS? To answer that question, we need to know a little bit about the Aston Martin lineup. At the bottom is the V8 Vantage, then the DB9 and finally the DBS. Their differences lie in engine and size, but they are all fantastically competent real-world machines. Track days, commuting, touring, a night out on the town — they take it in stride. All three offer an ear-tingling exhaust note, responsive chassis feedback and a unique and sumptuous interior, each clothed in a body shape that’s instantly recognizable. The DB9 even has rear seats! “But a true sports car shouldn’t have rear seats,” you might interject. To a large degree, we’d agree with you. The DBR9 and DBRS9, the racing versions of the DB9 that won the GT1 class at Le Mans and other sports-car races, have no rear seats. Equipped with a 6.0-liter V-12 engine, the DBS produces 510 bhp at 6500 rpm. That’s 40 more horsepower than the vaunted DB9, which is also V-12-powered. 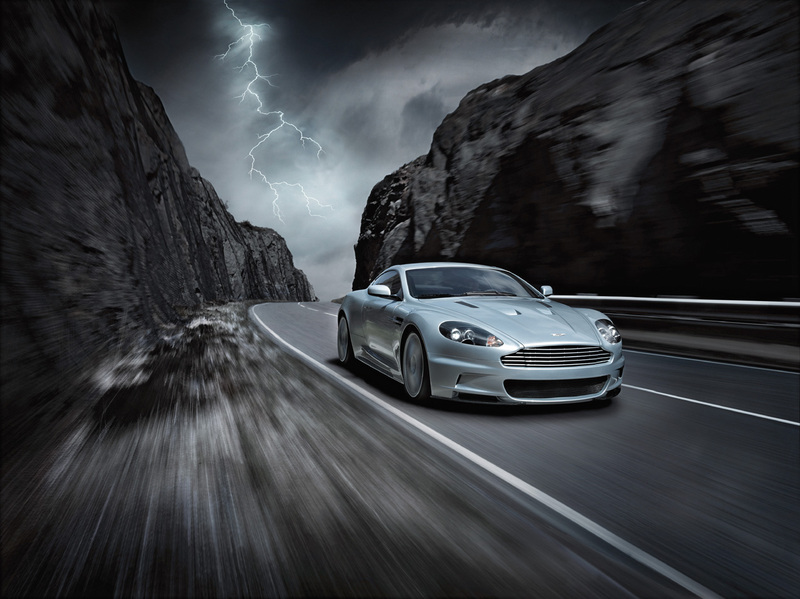 Interestingly, Aston notes the DBS actually produces less torque than the DB9; 420 lb.-ft. at 5750 rpm versus 443. Two tricks are used to increase power output: dual-path intake runners and reprofiled intake ports. When the engine screams to 5500 rpm, a secondary intake path opens up, allowing more air into the engine without sacrificing throttle crispness and torque at lower rpm. At full throttle, a bypass valve in the exhaust directs the spent gases to a different, less restrictive exit. Like all Aston powerplants, the engine is built by hand in Cologne, Germany, and delivered to the factory in Gaydon, England. So good is the basic engine, in fact, that a modified version is what powers the DBR9 and DBRS9 race cars. As befits a true sports car, the power from the all-aluminum engine is sent to the rear wheels through a manual transmission, but this one is mounted out back, right in front of the rear axle. This affords two benefits: more leg space for the driver and passenger and better weight distribution. With the transmission not in the middle of the chassis, the engine can be pushed back. Aston Martin considers the DBS a “mid-front engine” design, meaning the engine lies in front of the occupants, but behind the front axle.